We’d love your help. Let us know what’s wrong with this preview of Eaves of Destruction by Kate Carlisle. Shannon is in high demand among rival homeowners, who will do anything to win Best in Show. One-upmanship and even espionage break out among neighbors, construction crews, decorators, and landscapers. Thanks to several new hires, Shannon is sure she can handle the extra load--until murder throws a wrench in the works. To ask other readers questions about Eaves of Destruction, please sign up. Eaves of Destruction is the fifth book in the 'Fixer-Upper Mystery' cozy series by Kate Carlisle. In these books, Shannon, a ~30ish construction business owner, solves crimes as an amateur sleuth while helping renovate a wonderful seaside town in California. In this edition, the local town inspector causes trouble at several of her job sites and finds himself murdered in the neighbor's orangery (sun room / conservatory). Whodunit!?! Shannon is a fun protagonist. She pokes fun at herself but also Eaves of Destruction is the fifth book in the 'Fixer-Upper Mystery' cozy series by Kate Carlisle. In these books, Shannon, a ~30ish construction business owner, solves crimes as an amateur sleuth while helping renovate a wonderful seaside town in California. In this edition, the local town inspector causes trouble at several of her job sites and finds himself murdered in the neighbor's orangery (sun room / conservatory). Whodunit!?! Shannon is a fun protagonist. She pokes fun at herself but also knows when to be serious, just like the series itself. Obviously, if this many murders occurred in a small town, and the same person found the body all the time, she'd be locked up for some sort of charge to prevent anything else from happening! But this is a book, and there needs to be some level of recognition for that fine line of reality versus fiction. Of all the cozies I've read, this one is near the top of the list of those that manage that balance quite adeptly. The victim was mean and ruthless, he just invaded people's homes to inspect work even when it wasn't time or he didn't have permission to enter. The culprit was semi-believable, but I wish it had been someone else. The family we're focusing on is interesting, and I liked the addition of Amanda, a new contractor who helps save the day when too many jobs turn up. I liked that we saw more of Shannon's friends and their personal relationships with the men and/or families in their lives. I was glad to see the connection between the sheriff and Shannon turning into something much more easy-going. Shannon and her team have been called in by various homeowners to spruce up their houses before the annual Home and Garden competition, with one of them Shannon and one of her Foremen (Wade) are seriously wondering about actually turning down the work, Petsy Jorgenssen is snooty, short tempered and quite frankly rude! But with a new female carpenter/wood carver eager to have a go at repairing the damage to some walls they stick with it. It would help if the local incompetent building Inspector Shannon and her team have been called in by various homeowners to spruce up their houses before the annual Home and Garden competition, with one of them Shannon and one of her Foremen (Wade) are seriously wondering about actually turning down the work, Petsy Jorgenssen is snooty, short tempered and quite frankly rude! But with a new female carpenter/wood carver eager to have a go at repairing the damage to some walls they stick with it. The Victorian Home And Garden Show is a month away from and all the owners of the homes want a revocation on their home. Shannon Hammer is busy enough to hire another skilled carpenter to work on a repairing damaged eaves. The owner's wife caused a lot of trouble. Before long the body count started to climb. Shannon begins to explore the deaths and she will encounter jealousy, greed, blackmail, exchange babies, and evil before the answer becomes apparent. Shannon must work fast before her new hi The Victorian Home And Garden Show is a month away from and all the owners of the homes want a revocation on their home. Shannon Hammer is busy enough to hire another skilled carpenter to work on a repairing damaged eaves. The owner's wife caused a lot of trouble. Before long the body count started to climb. Shannon begins to explore the deaths and she will encounter jealousy, greed, blackmail, exchange babies, and evil before the answer becomes apparent. Shannon must work fast before her new hire loses her life. I highly recommend this book. EAVES OF DESTRUCTION is the fifth book in the Fixer-Upper series by Kate Carlisle. I’m really enjoying this series. Shannon Hammer is such a wonderful character. I love that although she is technically an amateur sleuth, she isn’t one of those who does stupid things in order for the story to work out. All of her actions are very organic and rational. In this book, there’s a lot of tension between homeowners. Shannon gets a job that involves working with a very rude client. She is also looking to expand her team, so she does have a lot happening in her life. When a building inspector is found dead on one of her jobsites, she is looking at some serious problems if she wants to avoid the police. So once again, it’s up to her to discover what really happened. I am a big fan of Carlisle’s writing style. It has a bit of a small-town feel and all the details of a great do-it-yourself catalogue, but it doesn’t feel overwhelming either. I personally don’t have a huge interest in construction yet I can still find enjoyment in reading this series. So even if you think it might not be your cup of tea, I would suggest giving it a shot anyway. You may be surprised by how much you like it. This book does have a slower pace than some of the other books I’ve read by this author but I really didn’t mind because I enjoy being in Shannon’s head. She really is a character that I can stand by. She’s never too over the top and I also love her independence. Also, I know this is a strange thing to say, but I like how treats other people. She is just an all-around good girl. Shannon has been asked to do work on a home that will be entered into the local Victorian Home and Garden Tour, the only problem is the home owner is rude and obnoxious. With all the work that needs to be done on other houses for the tour Shannon hires a young woman who enjoys working with wood and puts her to work immediately. When the local building inspector turns up dead everyone can understand why, not only is he corrupt but he was always showing up at unexpected times and making trouble. S Shannon has been asked to do work on a home that will be entered into the local Victorian Home and Garden Tour, the only problem is the home owner is rude and obnoxious. With all the work that needs to be done on other houses for the tour Shannon hires a young woman who enjoys working with wood and puts her to work immediately. When the local building inspector turns up dead everyone can understand why, not only is he corrupt but he was always showing up at unexpected times and making trouble. Shannon realizes she must find out who the killer is before someone else ends up dead, the only problem is that there are more suspects than answers. Having friends to help figure out just who the murderer is doesn't hurt though. Shannon feels guilty about leaving her new hire to deal with such an obnoxious client but the mystery needs to be solved and quick. Tag along with Shannon and try figure out whodunit, could it have been an ex-girl friend, an angry contractor, or a crime of passion? I find this series is a fun cozy read, filled with wonderful writing, great characters, and a plot that will keep you guessing. I'm excited to see what happens with Shannon next and what lovely old home she will be working on. My Thoughts: In the beautiful little town of Lighthouse Cove, in Northern California, Shannon Hammer enjoys success with the construction company she inherited from her dad. Renovating beautiful Victorian houses is her specialty. She also seems to find a lot of dead bodies, and her tendency to try to solve the mysteries is a fun part of the story. I enjoyed her relationship with the mystery writer, Mac, and couldn’t help but love how she tried to solve another kind of mystery for her newest construction worker, Amanda Walsh. Some of the characters were clearly suspects just because of their horrific personalities, while others just happened to be in the wrong place at the wrong time. Watching Shannon and her crew do their jobs, in addition to helping find the killer, kept me turning the pages of Eaves of Destruction. I also enjoy the TV show based on the books. 4.5 stars. In this book, there’s a lot of tension between homeowners. Shannon gets a job that involves working with a very rude client. She is also looking to EAVES OF DESTRUCTION is the fifth book in the Fixer-Upper series by Kate Carlisle. I’m really enjoying this series. Shannon Hammer is such a wonderful character. I love that although she is technically an amateur sleuth, she isn’t one of those who does stupid things in order for the story to work out. All of her actions are very organic and rational. EAVES OF DESTRUCTION is filled with intrigue and mystery. I highly recommend Kate Carlisle for anyone who wants to read a good mystery. 3.5 Good book, story line was a little weird. Also a little weird that the main character and her boyfriend enjoy and spend so much time talking about murder! Another great book in this mystery series that I love!! Another excellent visit with Shannon, Mac and their group of friends/coworkers as they interact with each other, the customers they assist and of course with a dead body or two to keep things interesting. Excellent character development with personalities that make you want to be friends with the characters added to a well plotted story line with just enough twists to keep you interested and entertained! This is an excellent series and I can't wait to read the next one that comes out! This explosive new novel in the Fixer-Upper Mystery series pulled me in from the beginning of the action and kept my thoughts on it long after reading the final page. Most of the characters are familiar to those who have read earlier books in the series, yet a new reader can come up to speed with the charming folks in Lighthouse Cove, on the northern California coast. Shannon has been managing her father’s Hammer Construction for a few years, and loves making repairs or restoring the gorgeous, detailed Victorian homes in Lighthouse Cove. As the town prepares for its Home and Garden Tour, she and her crews are maxed out on work. A young woman inquires about work, and she is exactly the kind of person Shannon needs. Amanda is even-tempered, loves her work and has a kind heart toward people, and is very talented in trim carpentry and carving replacement details for homeowners. Victorian homes, both new and old, are on huge lots on Cranberry Circle, where Hammer Construction is doing work prior to the tour. One home belongs to the Jorgensen’s, Petsy and Matthew and their daughter, Lindsey. Petsy is one of the meanest people they have worked for, but her sharp tongue jabs at her family members as well as Shannon and her crew. Amanda is doing detail woodwork in the gorgeous home, and an orangerie (solarium) is being added. Another home is across the street, belonging to Joan and Stan Derry. There is a section of dry rot in their basement in urgent need of replacement. Shannon takes some time to look at the orangerie at Joan’s to see how it is constructed. Joe Scully is the building inspector who should have been retired years ago. He is rude, holds up inspections and delays construction schedules, is suspected of receiving bribes so people will pass inspection, and goes where he doesn’t belong – such as walking into the Derry’s home to “inspect” the work being done in the basement. The response he got was not positive, as it doesn’t require inspections, so they chased him out, blaming him for the dry rot as his son-in-law had done the original work. Stan even threatens to kill him…bad. It wasn’t long before Scully was found dead, murdered and lying in their orangerie. Amanda seems too good to be true! She proves to be a more than capable employee. Yet when Mr. Jorgensen shows Shannon and Amanda a portrait of one of his ancestors that Amanda looks exactly like, Amanda’s reaction leads Shannon to mull it over when she isn’t thinking about Scully. The author has a delightful cast of characters for the most part, very well-defined. She uses snappy dialog, steady action and reasoning to further the plot and round out the people. Shannon is my favorite, of course, and Amanda is probably a new favorite as well. One of the reasons I enjoy both the series and the ladies is due to the many years I did construction admin. Shannon is the kind of boss I would like to have had. The plot twists continually change the mysteries; some are gentle.and others pack a punch that is more like a head shot. Kate Carlyle has long been a favorite author of mine and in this novel she definitely raises the bar for future novels! She has given Shannon the best kind of boyfriend to match her penchant for finding murder and mayhem. Mac is a well-known mystery author, and they often discuss mysteries that are part of her and her friends’ daily life. I enjoy seeing the thought processes he uses in analyzing the situation. I also enjoy this novel having more than one mystery. I had figured out only a fraction of the mysteries and no motive, so was totally stunned at the full solutions! Suspense turned into horror while awaiting the final actions; it seemed like forever before I could draw a deep breath again. I was completely satisfied with how the novel ended, and highly recommend it! 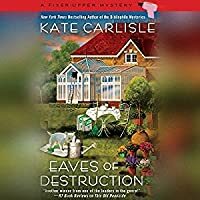 EAVES OF DESTRUCTION by Kate Carlisle is the fifth book in the Fixer-Upper Mystery series, but I’m embarrassed to say, the first one I’ve read. Now mind you, I have the first three books in the series sitting in my to-read stack and while I had good intentions of getting caught up this past summer, life got in the way. When Kate mentioned that she had developed a recipe to go with the book, I jumped at the chance to share it and read EAVES OF DESTRUCTION for my blog post. Based on her Bibliophil EAVES OF DESTRUCTION by Kate Carlisle is the fifth book in the Fixer-Upper Mystery series, but I’m embarrassed to say, the first one I’ve read. Now mind you, I have the first three books in the series sitting in my to-read stack and while I had good intentions of getting caught up this past summer, life got in the way. When Kate mentioned that she had developed a recipe to go with the book, I jumped at the chance to share it and read EAVES OF DESTRUCTION for my blog post. Based on her Bibliophile series (one of my favs!) I was sure that this new release would be easy to read as a stand-alone, and I was correct. I also knew that I would be entertained along with being motivated to get caught up on the other books in the series. Even though the Fixer-Upper Mysteries have been and are currently being made into movies for the Hallmark Mystery Channel, Kate provides vivid descriptions of both the setting and each scene which brings the reader fully into the story. I loved being allowed to “see” snippets of the protagonist, Shannon Hammer’s childhood while she trailed her father around construction sites outfitted in a pink hardhat and a pink tool belt. Now that Shannon is running her father’s company, Hammer Construction, and is a skilled carpenter herself, the author carefully provides enough details to make her projects fully realistic without detracting from the plot. I think it’s wonderful that a strong female protagonist is shown thriving in an industry that is dominated by men. It’s obvious that much research has gone in to the development of Shannon’s livelihood. The supporting characters are well-fleshed out and I loved the repartee between Shannon and her boyfriend, Mac. They make an adorable couple and are good at bouncing ideas off each other to solve the murder together. The mystery surrounding the murder of the detestable building inspector, who has made it his life’s mission to make Shannon miserable, is well constructed. The clues are judiciously plotted to keep the reader guessing. I thought I had a firm handle on what direction the story was headed only to be diverted somewhere else with a new suspect, a new clue, and a bombshell that totally caught me off-guard! And then the surprising reveal had me promising myself that I am going to start with the first book and catch up soon! Lighthouse Cove contractor Shannon Hammer is busy, busy, busy as homeowners prepare for the annual Victorian Home and Garden Tour. One of Shannon's employers is a woman not known for being nice. Shannon does her best to work with her, despite the woman's nasty temperament. Shannon also has a new employee that has a secret that makes Shannon wonder about her intentions. Things are heating up as the competition with spying and construction workers making sure their work is the best. But when the cit Lighthouse Cove contractor Shannon Hammer is busy, busy, busy as homeowners prepare for the annual Victorian Home and Garden Tour. I have a love/hate relationship with this series. After the last one I almost swore off it, but I decided to give the next one a try, and I'm glad I did. This is, to me, the best book of the series. I loved the story within the story, and watching Shannon and Mac worth together made me smile. I've been hooked on this series from the first book...each one since has just gotten better and better. I especially enjoy Shannon and her tenacity, in both her work and getting to the bottom of the current mystery she becomes immersed in...she definitely is a mystery magnet. The author has crafted characters who are so very real, their personalities tailored specifically to the part they play in each story, making them believable and multidimensional. Reoccurring characters are a joy to see as I've been hooked on this series from the first book...each one since has just gotten better and better. I especially enjoy Shannon and her tenacity, in both her work and getting to the bottom of the current mystery she becomes immersed in...she definitely is a mystery magnet. The author has crafted characters who are so very real, their personalities tailored specifically to the part they play in each story, making them believable and multidimensional. Reoccurring characters are a joy to see as they bring continuity to the series. I'm already looking forward to Shannon's involvement in the next mystery that befalls on her. A lot going on as usual in this mystery book about building and renovating. The location is wealthy California where Victorian-era homes are being judged for a contest with prestige attached. Sharon Hammer runs a renovation firm but every move is slowed down by the officious building inspector. Since he's the main disliked person in the tale it's not giving much away to say he ends up dead on one of the many work sites in town. Sometimes to keep tension in a series you need to keep the strong an A lot going on as usual in this mystery book about building and renovating. The location is wealthy California where Victorian-era homes are being judged for a contest with prestige attached. Sharon Hammer runs a renovation firm but every move is slowed down by the officious building inspector. Since he's the main disliked person in the tale it's not giving much away to say he ends up dead on one of the many work sites in town. Sometimes to keep tension in a series you need to keep the strong antagonist. The other characters are a variety of personalities but mostly doing their best to live their lives. Without someone whose role it is to get in the way, the stories have a danger of becoming soap operas. We'll see what happens in the next book, when presumably the town will have to replace the inspector. I enjoyed the details and personal backgrounds which include finding family, finding romance, finding identity. Again, if a strongly disliked person is dead, there is no great reason to find a killer, except to absolve the main character of blame. The background tales engage our emotions. Generally, when you think of a Home and Garden tour, murder is NOT the first thing that comes to mind, but we've got plenty of it in Lighthouse Cove this time around! It'll take serious sleuthing by Shannon, Mac, and their friends to find the culprit this time around. Villains abound where you least expect them. Well-written, interesting characters are what keep me reading a series and the characters in this series are great. I enjoy Shannon and Mac tremendously. Shannon's crew are also great. I' Generally, when you think of a Home and Garden tour, murder is NOT the first thing that comes to mind, but we've got plenty of it in Lighthouse Cove this time around! It'll take serious sleuthing by Shannon, Mac, and their friends to find the culprit this time around. Villains abound where you least expect them. Well-written, interesting characters are what keep me reading a series and the characters in this series are great. I enjoy Shannon and Mac tremendously. Shannon's crew are also great. I'm looking forward to getting to know the newest member more as well. While I had wondered about the actual villain, I really didn't focus on them until closer to the end. There were plenty of red herrings in this book to keep you guessing on who the villain really was. However, the book still moved along at a decent pace and wasn't too slow, even with all those extra misleading clues. This is the fifth book in this series and I look forward to each new release. Kate Carlisle crafts such wonderful stories with quaint settings, wonderful characters and mysteries that keep her readers on their toes. I look forward to each new trip back to Lighthouse Cove to catch up with Shannon and the rest of the characters to see what the author has in store form them. From the very first book I just fell in love with Shannon Hammer. I think part of it is because she is so different from me in This is the fifth book in this series and I look forward to each new release. Kate Carlisle crafts such wonderful stories with quaint settings, wonderful characters and mysteries that keep her readers on their toes. I look forward to each new trip back to Lighthouse Cove to catch up with Shannon and the rest of the characters to see what the author has in store form them. From the very first book I just fell in love with Shannon Hammer. I think part of it is because she is so different from me in terms of her profession and skills. Shannon is one of those characters I could see as a friend in real life. She is a great friend, thoughtful, and warm-hearted. She has a great group of friends who are supportive and caring. Their friendships have a warm authentic feel. Shannon's romance with Mac is progressing with a natural feel. I love the relationship between these two. The mystery is solid. The victims are not well liked so this give the author plenty of suspects to choose from with plausible and believable motives. There are some nicely done twists and turns that kept me engaged until the final reveal. This is an excellent book. It's well written and keeps ones attention. Everytime i thought the mystery was about to be exposed it would get more complex and kept me guessing. There were twists I just didn't see coming. I highly suggest this book. I usually enjoy this series, but in this book Shannon’s sleuthing was annoying. She seemed to spend more time trying to figure the mystery, than she did working. And the ending seemed a little abrupt and very far fetched. Great Googly Moogly, two terrific mysteries in a row tonight!! Wowsers. I like this series, but its been awhile since I read one - well I was sucked right back in and this one did NOT disappoint at all. Twists and turns and freak outs galore. Really good read!!! Eaves of Destruction by Kate Carlisle is the fifth book in A Fixer-Upper Mystery series. Shannon Hammer is busy running Hammer Construction in Lighthouse Cove, California. Many homeowners are hiring Hammer Construction to fix up their residences before the Lighthouse Cove Victorian Home and Garden Tour. Everyone wants to win Best in Show which comes with a large cash prize and this year they have a famous mystery author as the judge. 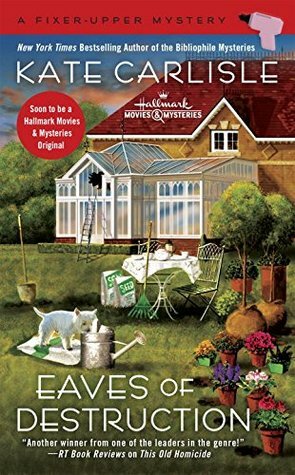 Petsy Jorgensen is Shannon’s most difficult client and matters Eaves of Destruction by Kate Carlisle is the fifth book in A Fixer-Upper Mystery series. Shannon Hammer is busy running Hammer Construction in Lighthouse Cove, California. Many homeowners are hiring Hammer Construction to fix up their residences before the Lighthouse Cove Victorian Home and Garden Tour. Everyone wants to win Best in Show which comes with a large cash prize and this year they have a famous mystery author as the judge. Petsy Jorgensen is Shannon’s most difficult client and matters are not helped by the interference of Joe Scully, the building inspector (nepotism got him the job). Joe seems to have it out for Shannon, and he keeps popping up at her various job sites causing problems. Shannon arrives at the Jorgensen residence one morning and hears screaming coming from Joan Derry’s yard (across the street). Shannon takes off running and finds Joe Scully dead in the Derry orangery with a chisel sticking out of his stomach. Who disliked Joe enough to kill him? Shannon, with her natural curiosity, starts digging into Joe’s movements before his death. Soon, though, another death rocks the town. Shannon with help from mystery writer (and boyfriend), Mackintyre Sullivan set out to track down the killer before they strike again. Eaves of Destruction is well-written, has engaging characters, and a good pace. I am a fan of Shannon Hammer. She is a strong, intelligent female character in a male dominated industry. Shannon has a warm heart, a sense of humor, and loving friends and family. I also like the secondary characters such as Jane Hennessey (Shannon’s best friend) and Mackintyre Sullivan (Shannon’s love interest). The new carpenter, Amanda Walsh was a great addition to the story. I find that each book in A Fixer-Upper Mystery series is better than the prior one. The mystery was complex in design with a couple of promising suspects. I appreciated the author’s use of misdirection and the reason why the murders occurred. I loved the descriptions of the beautiful Victorian homes (I love Queen Anne Victorian homes) in Lighthouse Cove. The dialogue is engaging and realistic. There is just the right amount of humor in the story along with romance (it blends in with the story beautifully). Eaves of Destruction can be read alone, but I do recommend the other books in the series (you can also watch the movies). I have long been a fan of this author, but this mystery raises the bar for the future - the best of this series. It is great to visit Lighthouse Cove and the delightful folks who live there. Shannon Hammer, her boyfriend and well-known mystery writer Mac, work together to solve a real poser of a mystery. Shannon now manages Hammer Construction, her father's company. She especially loves working on Victorian homes - both the originals and the contemporary ones her father built. With an upcoming ho I have long been a fan of this author, but this mystery raises the bar for the future - the best of this series. It is great to visit Lighthouse Cove and the delightful folks who live there. Shannon Hammer, her boyfriend and well-known mystery writer Mac, work together to solve a real poser of a mystery. Shannon now manages Hammer Construction, her father's company. She especially loves working on Victorian homes - both the originals and the contemporary ones her father built. With an upcoming home tour, there is even more business than usual. She hires a very talented woodworker, which frees her up to visit the jobsites and help where needed, but Amanda seems be a young lady of mystery. At least she is a dream come true for the company. The local construction inspector is disliked by most of the builders in town. It is suspected that he takes bribes to keep secrets, or to pass inspections, while delighting to hold up people's jobs. He is found murdered at one of the homes Shannon is working at. While she isn't going to miss him, she wouldn't have wished him dead. She wants to help take any suspicion from her clients and get a killer off the streets, but this time might prove to be one too many for Shannon. Being a woman-owned contracting company is still an anomaly in some of the good-old-boy networks. That is not a challenge faced by Shannon, either as a boss or a contractor, as her reputation for excellence and being fair precedes her. She surrounds herself with the best employees available, and it is a treat to meet her newest one, Amanda. The fact that they can work for one of the nastiest women in town speaks volumes. While I had an idea about one of the mysteries, there were others I couldn't begin to solve, much less find motives. The end is a huge surprise, a series of unexpected events. The characters, the contracting, and the handful of mysteries vying for attention make this a compelling read. The explosive action and surprises make it one of the best contemporary cozy mysteries of the season and not to be missed! Highly recommended! I received a copy of this from the publisher but was not obligated to provide a review; these opinions are my own. So...we have Shannon Hammer...owner of a local construction company...and someone who just happens to have a reputation for finding murdered people. In this book she just happens to be at a house where a really awful irritating dishonest building inspector is found dead in an orangery...a greenhouse. He has a well made chisel stuck in his tummy! Yikes! Fortunately Shannon is not a suspect but some of the people she is associated with could be! And...there are lots of potential suspects. This was my first venture into this series. I liked it but I didn’t connect with it as much as I have with other books within this genre. There was something missing for me. There was a lot of talking and cooking and lunching but not a lot of crime solving. It could be because I have not read any other books in this series. But...I am not certain I liked this enough to read more about these characters. I loved the descriptions of the homes that Shannon was working on. Petsy...a highly irritable home owner...provided some interesting moments. I am sure that this book and this series has many followers. It was well written and enjoyable. But...for my personal tastes...it didn’t have enough “oomph.” I needed a little more excitement! I really enjoyed this episode of Shannon Hammer, construction company owner and restorer of Victorian Homes life and adventures. Shannon has worked with many home owners, but, this Pesty Jorgenson takes the honor of her worst encounter ever. Pesty is simply a pest. She doesn't appear to like anyone. Shannon doesn't even try to figure out why Pesty is so mean-spirited, she just has an instant dislike for the person. Pesty's home is another feeling altogether. The Victorian is amazing and the chall I really enjoyed this episode of Shannon Hammer, construction company owner and restorer of Victorian Homes life and adventures. Shannon has worked with many home owners, but, this Pesty Jorgenson takes the honor of her worst encounter ever. Pesty is simply a pest. She doesn't appear to like anyone. Shannon doesn't even try to figure out why Pesty is so mean-spirited, she just has an instant dislike for the person. Pesty's home is another feeling altogether. The Victorian is amazing and the challenge awesome to restore it in time for the annual Victorian Home and Garden Tour. In order to handle all the jobs that have popped up for the festival, Shannon is introduced to a new lady worker who specializes in wood carving. Just what the Jorgenson house needs. However, there seems to be an instant 'recognition' between Amanda, the new worker, and the Jorgensons. What is going on? Then, the mean building inspector, Joe Scully ends up dead and all of Shannon's detective senses go on full alert. She contacts, Mac, the Author and her love interest, and the two try to figure it all out. Golden Heart and Daphne du Maurier Award winning author Kate Carlisle spent over twenty years working in television production as an Associate Director for game and variety shows, including The Midnight Special, Solid Gold and The Gong Show. She traveled the world as a Dating Game chaperone and performed strange acts of silliness on The Gong Show. She also studied acting and singing, toiled in vin Golden Heart and Daphne du Maurier Award winning author Kate Carlisle spent over twenty years working in television production as an Associate Director for game and variety shows, including The Midnight Special, Solid Gold and The Gong Show. She traveled the world as a Dating Game chaperone and performed strange acts of silliness on The Gong Show. She also studied acting and singing, toiled in vineyards, collected books, joined a commune, sold fried chicken, modeled spring fashions and worked for a cruise ship line, but it was the year she spent in law school that finally drove her to begin writing fiction. It seemed the safest way to kill off her professors. Those professors are breathing easier now that Kate spends most of her time writing near the beach in Southern California where she lives with her perfect husband.